Whether your goal is increasing capacity through greater space utilization or improving your inventory control and cost per pick, we will work with you to develop a system design that is tailored to your specific needs. Beginning with an in-depth analysis of your storage and handling needs, our experienced sales team will develop a design best suited to the allotted space and budget. From selective racking to a fully automated warehousing system, using the latest computer technology, we will supervise every aspect of your project through from the onset to the very end. We are not just in the sales business. We are what our name says; Material Handling Solutions. When purchasing a forklift, whether new or preowned, the following are important facts to consider before making a decision. 1: How heavy and what size are your typical loads? It's important to think about all loads which will need to be transported now and in the not to distant future. Even though generally you don't want to purchase a forklift with more capacity then you need (higher capacity equals a higher purchase price), you need to allow for a lift capacity that will safely carry all load possibilities. Also to be considered is how high do your loads need to be lifted as forklift capacity reduces the higher the load is lifted. Most standard forklift are designed for carrying 42" x 48" pallets and varying width and length can reduce capacity. Special attachments needed to lift your load also adds additional weight to the front of the lift, reducing capacity. 2: How high do you need to lift the load? Do you require pallet placement on storage racks or mezzanines? On the flip side, what is the lowest doorway or beam you will need the forklift to fit under or drive through. Do you need a forklift with a short mast to fit into shipping containers or unstack inside of trailers? 3: Will you be using it indoors, outdoors, or both? The surface areas of your worksite will determine what type of tires you will need. For example, high reach forklifts are usually only suitable for perfectly flat dry surfaces and indoor use. Most standard, sit down (counter balance) forklifts are more flexible and can be used indoor or outdoor, depending on the ground surface If your worksite has rough and unstable surfaces, you might require 4×4 (all terrain or rough type) forklift. The surface will also determine the type of tires needed. 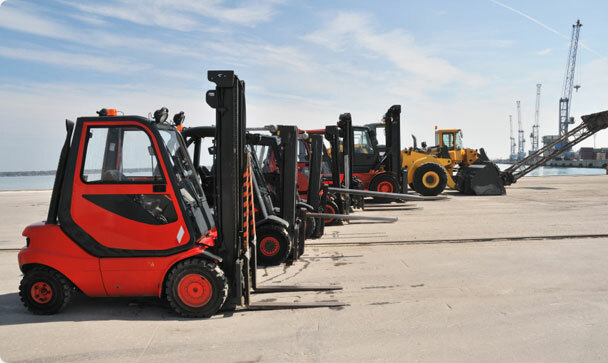 This is an important determination because two forklifts with identical lifting capabilities may have entirely different chassis to accomodate indoor (cushion) tires or outdoor (pneumatic or solid pneumatic) tires. Of the four typical fuel types of gasoline, diesel, electric & liquid propane (LP or LPG) only the last two are really suitable for indoor use due to fumes, and in some operations only an electric will do. 4: How much room do you have to maneuver? How wide are your narrowest aisles? If the forklift is mainly going to be used indoors, then maneuverability is a major consideration. How tightly does it need to turn? How much physical space does it occupy? Will the driver be picking small loads from overhead storage areas? 5: How many hours per day will it be used? How much usage your forklift will get, greatly affects the age and fuel type that is recommended. If the forklift will be used less than 4 hours of continuous use per day, we would recommend considering a preowned reconditioned forklift. Here you can save 50% or more on the initial outlay. For more than 4 hours a day, new or leased forklifts may work out to be less expense in the long run when maintenance is factored in. If you require a forklift to run all day, then LPG is usually the ideal option as spare fuel tanks can be replaced swiftly. This is strictly a customer preference. A lift may be leased with or without maintenance, leased with a purchase option at the end, or a straight purchase. Some customers prefer a lease with full maintenance because the monthly expense is known at the onset and easily budgeted. There are no surprises in a given month when the lift may need new tires, engine, etc. Also a replacement lift is normally put in place to avoid downtime. Operator training is provided at no cost when a piece of equipment is purchased or on a long term lease. Financing is available from a number of different lenders that we work with depending on current interest rates, length of term and whether the equipment is new or preowned. Typical financing for a preowned forklift would be a 36 months lease with a $1.00 purchase option at the end. New equipment may be financed for longer periods. It is also possible to bundle a complete system into one lease, such as a forklift(s), rack system, dock levelers, truck restraints, and shrinkwrap machine. Our goal is to help our clients achieve their maximm productivity through efficient and correctly applied material handling systems within their budgetary restraints. Servicing Columbia, Charleston and other locations in South Carolina. Copyright © 2011 Material Handling Solutions Inc., All Rights Reserved. Website designed and hosted by Slickhead Studios.